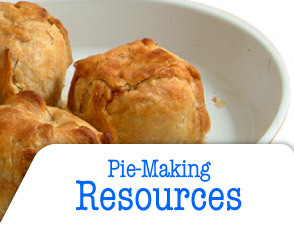 Incredible EMILE HENRY pie dishes for even baking: All of the recipes in Penny’s video and the ones she teaches and demonstrates are for a 9 or 10 inch "deep dish" pie dish. This makes a large pie, 20% or 30% larger than the typical "Pie Shop" or supermarket pie, and will yield 8 to 10 servings. The choice of pie dish (also called a “pie plate”) shape and material can make a substantial difference in how your pies turn out. Penny has found that the pie dishes made by the French pottery company EMILE HENRY are far superior to any other she’s tried, and she has tried them ALL! 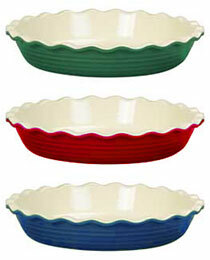 Pies baked in EMILE HENRY dishes bake more evenly, and the bottom crust comes out as crisp and flaky as the top! Sometimes when pies are baked in foil, metal or even PYREX, they can come out tough or with a soggy bottom crust. This never occurs when using EMILE HENRY bakeware. EMILE HENRY pie dishes, although costlier than many other brands, are well worth the additional expense for the enhanced quality that they impart to your pies. Besides that, they are amazingly tough, clean easily, and add a real touch of elegance to the presentation of your pies. Thes wonderful dishes are available in our online store. The best unbleached flour: Penny uses unbleached all-purpose flour for all of her pie recipes. She has been using KING ARTHUR brand flour for several years with consistent and excellent results. Unbleached all-purpose flour is generally available in most supermarkets and grocery stores and is available in many stores nationwide, or from The Baker’s Catalog. A rolling pin without peer: "I've used many brands of rolling pins but Vic Firth's are the best," Penny says. "I think it's very interesting that Vic was a tympanist (kettle drum player) for the Boston Symphony Orchestra for 40 years and now manufactures drum sticks and gourmet cooking utensils. His 'Vic Firth Gourmet' line of products is terrific even if you only keep time to the music in your kitchen." 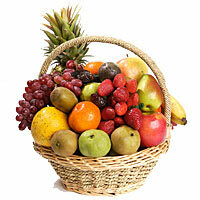 Penny always tries to use fresh, in-season ORGANICALLY GROWN fruits for her pies and other dishes. The best place to purchase these is directly from the farmer! Many areas have regular Farmer’s Markets where the farmer brings his produce for sale directly to the consumer during the harvest season. If you have any questions about which fruit would be best for your pie, the best source for the answer is the farmer or orchard operator himself! They will be able to tell you which of the available varieties of will be best for your purpose. As an example, all of the pies that Penny won ribbons with at the 2003 L.A. County Fair were filled with fruit recommended to her by the farmers at the Montrose Harvest Market, held weekly in Montrose, CA. Recently, Penny sent a large quantity of her Pie Class On DVD to members of this organization for testing of her video and recipes. She now has the official "Seal Of Approval" from the club, which has a huge membership. Their magazine - "Cooking Pleasures" has a readership of almost 5 million! 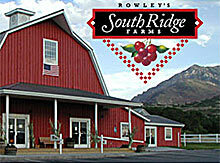 This is a cute, rural little place about an hour east of Los Angeles, noted for their wonderful orchards. Most of the orchards there have a "YOU PICK" time during the harvest season. You can pick your own apples, and boy - are they GOOD! This is a listing of family-friendly products and interesting items. My husband Al and I always stop here on our way from L.A. to Idaho to visit Al's mom. They have some of the best apples we've EVER had! They have ice cream and homemade fudge, too, but we'll just keep quiet about that, OK? It's right about in the middle of Utah, next to Interstate 15 in Santaquin. Probably just about everything you ever wanted to know about apples, plus an awful lot that you'd never have thought to ask about. 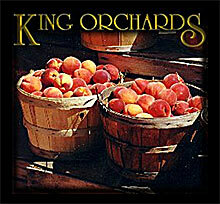 They have a great "Orchard Locator" which has listings for orchards all over the country. 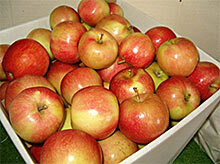 You can mail order apples and sour cherries for pies from these wonderful people in Michigan. I got some of their sour cherries to test out in a pie, and they were fabulous! 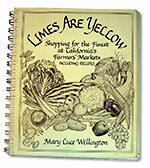 Choosing the right fruits and vegetables for your pies is essential to great taste: "LIMES ARE YELLOW" is an excellent book by Mary Luce Wellington full of information on the proper methods of selecting fruits and vegetables for pies, canning and other uses. Using honey instead of sugar: Most of the recipes for Penny’s Pies are sweetened with honey instead of refined white sugar. The farmer’s market mentioned above is also where she purchases pure, unprocessed honey, directly from the beekeeper. Yum! Copyright © 2005-2012 Penny's Pie Classes. All Rights Reserved. 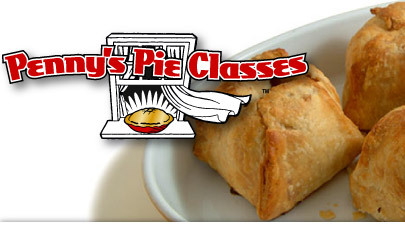 PENNY'S PIE CLASSES and the "pie on the windowsill" logo are trademarks owned by Penny's Pie Classes. All other trademarks are the property of their respective owners. Site design and maintenance by Design Strategies, Inc.